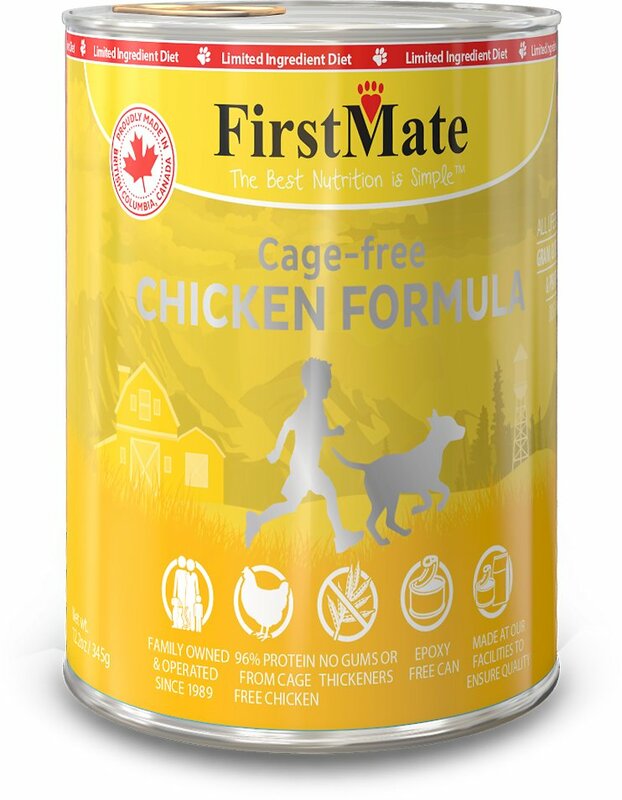 A delicious wet food with 96% protein from whole, free run Canadian chicken, and 4% protein from vegetables. Nutritionally complete and balanced for dogs of all ages. Limited ingredient recipe with absolutely no grains, glutens, carrageenan, or guar gum, in epoxy-free cans. A great option for pets prone to food sensitivities! Provides essential moisture to your dog’s diet. Great for the whole furry family: this recipe is also suitable for cats. Boneless chicken ,Water sufficient for processing, Potato Calcium Carbonate, Sodium Chloride, Dicalcium Phosphate Minerals: (Iron Proteinate, Zinc Proteinate, Copper Proteinate, Manganese Proteinate, Iodine), Vitamins: (Niacin, Vitamin E Supplement, Thiamine mononitrate ,D-pantothenic Acid, Riboflavin, Pyridoxine Hydrochloride, Vitamin A Supplement, Folic Acid, Biotin, Vitamin B12 Supplement, Vitamin D3 Supplement), Potassium Chloride, Choline Chloride, Taurine, Kale. Gestation & Lactation Feed up to 3 times the normal Adult amount. For sensitive pets, begin by introducing a small amount of the FirstMate in with the old food on the first day; then, gradually increase the amount of the new food, decreasing the amount of the old food, over the course of a week until they are eating exclusively FirstMate. GSD with digestive issues seems to doing OK on this food. The food seems to be better quality than most canned foods we've used before. Not sure yet. OMG! 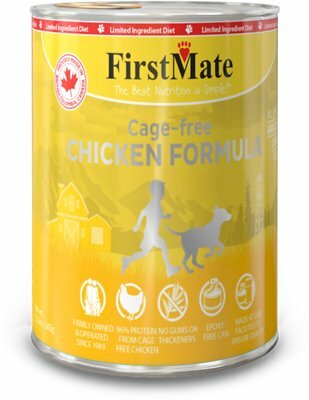 FirstMate chicken is top quality. Smells like chicken, nothing else. Could even eat it myself in a pinch. Highly recommended. I just wish FirstMate had more variety. Perhaps Lamb, Buffalo or Duck? I have 4 Shih Tzus and decided to try this brand that was recommended to me. All 4 of my dogs were not impressed with the food. They only eat 1/3-1/2 of it and leave the rest. I will try another grain free brand after looking at reviews. My dog loves this food. I like that it is not dry; it has a broth on top that you mix in. Great consistency and it actually smells like chicken. I had done some research on high quality foods and found this brand. She has no stomach issues eating this food. So, win-win! This food looks and smells good, just like if I had cooked up some chicken but all 4 dogs turn up their noses and walk away, maybe they are tired of chicken? Anyway, will be giving it to local shelter. My shiba mix really doesn't care much for eating, but he loves this stuff. His sensitive stomach is not bothered by this food at all. He is actually enjoying his food again! 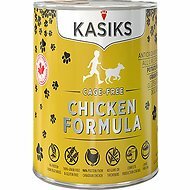 I mix this with some Annamaet Lean kibble, and he is excited to eat. Recommend! My very large dog (84-lb English Setter) was recently diagnosed with lymphoma. We've started chemo and I wanted to make sure he kept eating so I switched from kibble to canned food. 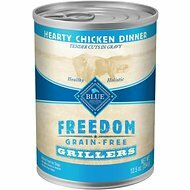 I was looking for a good quality canned food with plenty of protein and fat, minimal carbs. He loves this food. He's even gained weight since he was diagnosed. I'll be adding more First Mate varieties to future orders. Happy delivery was fast and my dog loves this food. This is first time I order and am very happy with the prices and how fast it was delivered. I will definitely recommend to other families and friends. This food is good quality with no Gums, Grains etc... I was really exited for my dogs and they love it. I just noticed that there is Kale in the food and one of my dogs is allergic. Oh well those of you who do not have dogs allergic to Kale this is a great food.